The Isaiah 40:1 Project: Ethiopian Jewish Orphan Adoption Program Launched! About 12 years ago, if you had reminded me of Isaiah 40:1 (comfort the nation of Israel) – I would have thought about contributions I had made to people in The Land, offerings to Israeli projects such as bomb shelters and purchasing goods from Israel. Then about 11 years ago I learned that today, the poorest and most persecuted Jewish people are still outside The Land of Israel. It is no surprise that the children are the most innocent, helpless and impacted by these conditions. And the children who have lost one or both parents are the most at risk of all. 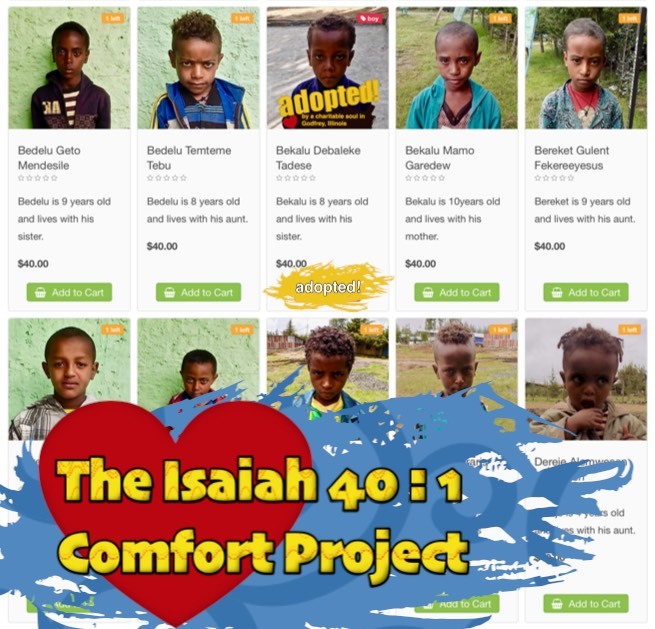 In this New Year, Ethiopia Judaica launches a new charitable giving program: The Isaiah 40:1 Comfort Project. In a prophetic coincidence, you can provide $40 for 1 of the least of Hashem's children, and that will bring the blessings of clean water, clean clothing, nutritious food, and educational opportunity for a Jewish orphan or destitute child for one month. Ours is a uniquely targeted charity, the disenfranchised, forgotten Bete Israel of Ethiopia (for more background read this). For over a decade we have focused on providing a way for those of us in the US and wealthier countries to buy handmade goods by these who have not yet had the opportunity to make aliyah, live in the poorest of conditions and are under persecution from the rest of their Ethiopian society. We have helped them drill wells, attend technical school and provide for their families with purchases of their handmade goods in our store – we believe that this is a way to affirm their dignity, by paying for things that they have made, rather than just giving them a handout. But the children, especially those that are orphaned really do need our unreserved support and gifts of provision rather than employment or product purchases. Won't you consider becoming a part of The Isaiah 40:1 Comfort Project? Welcome to our web site. I am going to be sharing with you some memories of our trip to Ethiopia. Each week I will reflect on what I saw among the Jewish people of Addis Ababa. We are a relatively small operation – really only a couple of concerned volunteers. But visitors to this website are what help us help the Ethiopian Jews, so we are very interested in expanding and reaching more people… And we need your assistance! Please answer a few questions for us – watch this page for a summary of the results! I am happy announce that Ethiopia Judaica is now partnering with ESCO, described below. Any donations received through this site will go directly to assisting with their projects, which directly affect the Bete Israel people that this site was started to help. The products that we sell here will still benefit individuals and their families of the Bete Israel community. A small purchase here can have a big impact in Ethiopia. For example, the sale of a $25 tapestry provides rent for a family for one month! El-Shaddai Charity Organization (ESCO) is a registered non-government and non-profit organization established to implement social projects that benefit the impoverished community in Ethiopia. The living standard of most people is beyond imagination. As was mentioned in previous blog articles, Ethiopia Judaica's mission is to assist those Ethiopians of Jewish descent. Many of their leaders and rabbis left for Israel in the first and second Exodus (1984 & 1991), so it is wonderful to have a trusted partner in Ethiopia to share our work with. The biggest threat to the Ethiopian Jews is disease. 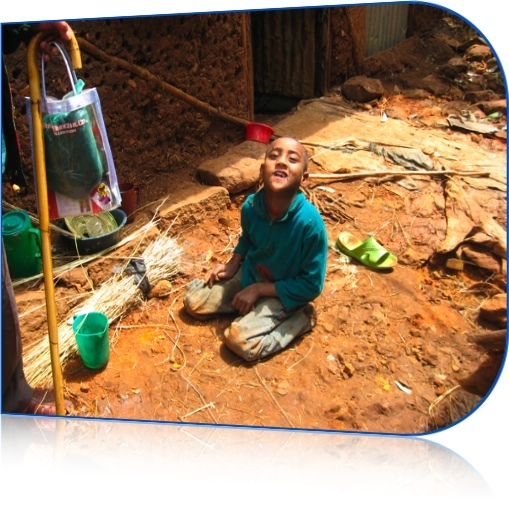 In the Gondar region, most diseases are caused or complicated by the scarcity of clean, safe drinking water. People of all ages can get very sick from water borne diseases, but children under 5 years old are at the highest risk of death. Scarcity of clean water also causes other hardships. Women do not have the chance to go to school because they are the collectors of water for their family and they spend much of the day walking to distant rivers and springs. Time and energy spent hauling water from great distances could be used much more productively farming or creating products such as what you see on this website. The availability of clean and safe water could bring more life opportunities to these people. ESCO has made it a priority to provide clean, safe, water to people in rural Ethiopia; they have already implemented five water projects. Sponsoring water projects is saving the lives of people while also improving the quality of their lives! 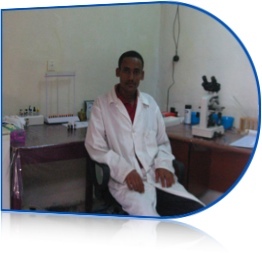 Apart from this project ESCO also provides free training programs to Ethiopian Jews. There are different fields of short term training that can change the life of these people in a positive manner. Many girls dropout of school, and are forced into prostitution just to survive or support their family. They risk unwanted pregnancies and many are exposed to HIV/AIDS. 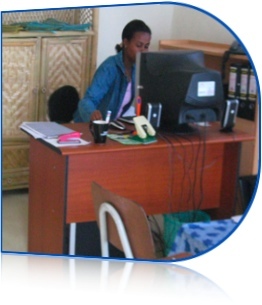 ESCO's programs provide the Ethiopian Jews with life skills, technical and vocational training. This means that they can make healthy, moral decisions and achieve employment in the fast growing private and social sectors of the economy. Please consider making a donation to either of these ESCO projects with the donate button. Please include a message specifying which project you want to support through the PayPal page. Health care in Ethiopia is scarce for all the Ethiopians, but for those who are among the Ethiopian Jews, there is no government provision. However, since they have recently begun to be recognized as truly Jewish and allowed to make Aliyah, Jewish organizations from around the world have been a part of providing a clinic for them both in Addis and in Gonder. The clinic that I saw and stayed at was in a house in what had once been a much better neighborhood (close to the Israeli Embassy). It was a two bedroom sturdy brick house (unlike the ones pictured in other blogs on this site). There were three rooms in a row outside of the house that had once been servants’ quarters. At the end of this row of rooms was a combination “toilet” (like that pictured on a different blog) and shower area. A number of the 70 orphaned children of the Beta Israel community came and showered here on Fridays to get cleaned up for Shabbat. We stayed in one of the outside rooms while there; the other two rooms were used as the lab and as a counseling/education center. Inside the house the two bedrooms were the treatment rooms and the living room was the reception area. All treatment was provided by two nurses. In Ethiopia, clinics are classified as lower, middle and upper clinics, depending on the types of services they provide. This clinic had quickly moved from a lower clinic to a middle clinic because of the quality and variety of services it offered. To be an upper clinic it would need to have a doctor there, which was being worked on while I was there, but was not yet actualized. There is no dental clinic for them, although the University of Addis dental clinic has treated some of their emergencies on occasion. In the Beta Israel community in Addis there are two children who are physically and emotionally handicapped, one is pictured here. There is no treatment for them in Ethiopia. The parents of this child asked me to please try to get help for their son. They had seen a taste of what could be done for him when an organization had come for two weeks with a medical team and he apparently received physical therapy treatment in his home. These parents long for help for their child, but there is none to be had in their country. They expressed the desire to send him where he could get help. A central tenet amongst those of the Jewish faith is compassion. The Torah and the Prophets often mention the duty of the righteous to provide and protect the widow, the poor, the orphan, and the stranger. As life unfolds in front of us, we often find that there are more needy people around us than there are resources for relief. And yet, it is evident that there are those whose standard of living is so far below ours, even pennies would help. During this feast season, the sukkah that we dwell in is a reminder of our dependency on G-d and the fragility of our dwelling against the immensity of creation. I am blessed to be a part of this small effort to give you the opportunity to support the Ethiopian Jews. It is significant that we are not really giving them a handout, but “affirming their dignity” by purchasing handcrafted goods from them. We can give them a sense of honor and self worth as they provide for their families. Teresa, myself and others associated with Estranged People are all serving in our various capacities as an offering to Adonai- none of us is drawing a salary or taking payment for our services. 100% of the price of the items you purchase is sent to the Jews of Ethiopia, there are no middle men or skimming of the monies. I hope you see this website, as I do- a unique opportunity to provide some relief to those who have been persecuted for their beliefs and find themselves waiting for over a decade for Aliyah. My wife and I thoroughly enjoy the colorful, whimsical tapestry work of the pillows and tallit bag that we purchased.